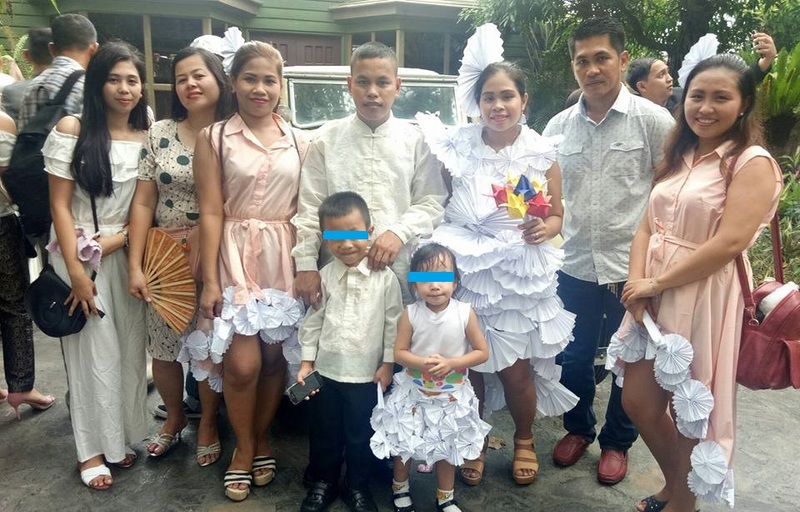 MANILA, Philippines – A poverty-stricken but creative bride recently went viral on social media for wearing a paper bridal gown she made for her wedding. Netizens expressed admiration over this bride’s creativity, especially knowing she saved a lot of money by making the gown on her own. Maricel Capinig Abaño hails from Batuan, Masbate in central Philippines but now lives in Project 6, Quezon City. The young lady is quite creative, posting many of her crafts on her Facebook page. She makes use of paper for her crafts. 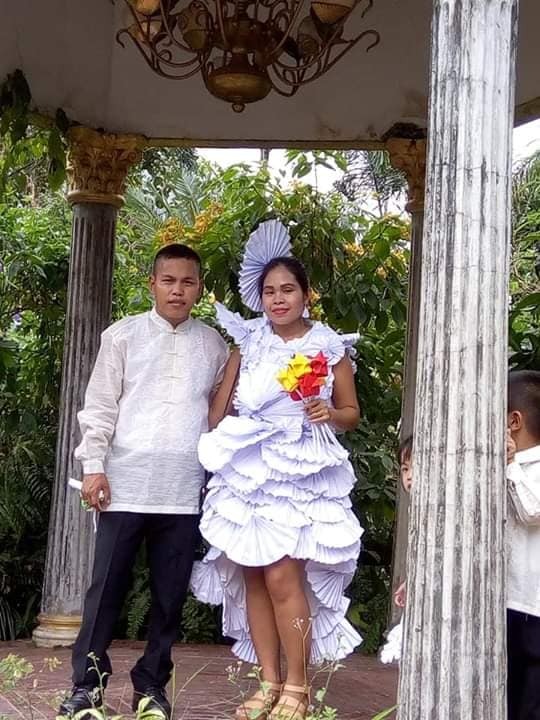 But her creativity was challenged when she decided to make her own bridal gown from paper for her wedding with Ronald Lucena Mata at the ‘Kasalang Bayan’ (mass wedding) last October 17. A bridal gown costs upwards from Php5,000 but Maricel spent only a few pesos on the bond paper and cartolina she used for the unique outfit. The lovely creation was made from folded pieces of bond paper, crafted to take the shape of a regular gown. Maricel stood out from the rest of the brides that day, that’s for sure. Her creative gown also came with a matching ‘hat’, fashioned in the same manner as the hats worn by ladies during royal weddings in Britain. This fashionable young lady certainly knows her craft, literally. The bride received help from friends Jellie Miasco Lurza and Ereca Matawaran. To complete the outfit, Maricel also made matching paper flowers, this time made from colorful pieces of construction paper. Her small entourage also wore matching outfits, with their skirts laced with folded paper similar to that in Maricel’s bridal gown. 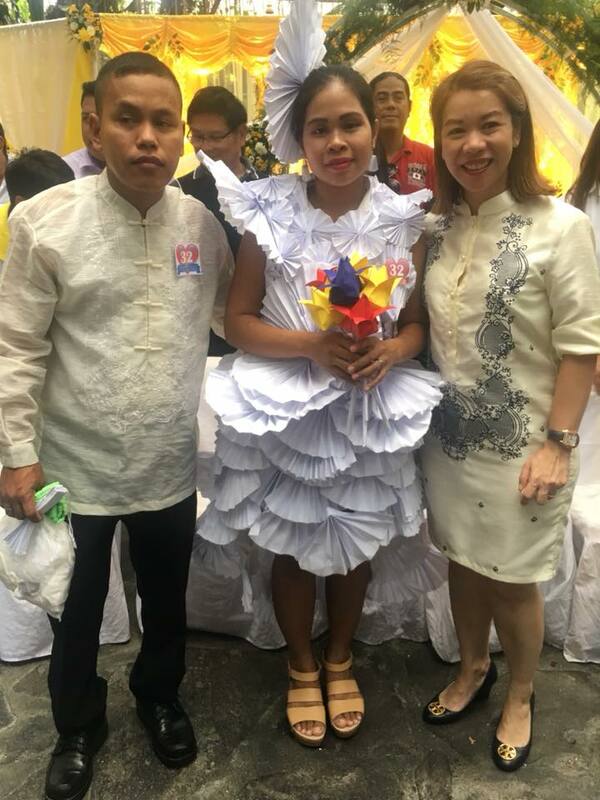 Councilor Marivic Co-Pilar who sponsored the mass wedding for 178 couples was so impressed with Maricel’s outfit that she took a photo with the couple and shared this on social media. She also gave the bride a special wedding gift.